Home » How do I know if I’m carrying out R&D? How do I know if I’m carrying out R&D? You may be carrying out research and development (R&D) activity if your company is working to resolve scientific or technological uncertainty. That is, attempting to solve a problem where no solution is evident. This can take many forms. And R&D projects can include work undertaken for a client as well as your own projects. Creating new products, processes or services. Changing or modifying an existing product, process or service to make it better. This means that if you’re not sure your project is scientifically or technologically possible, or you don’t know how to achieve it in practice, you could be resolving uncertainties and therefore qualify for R&D tax credits. Where does R&D start and finish? 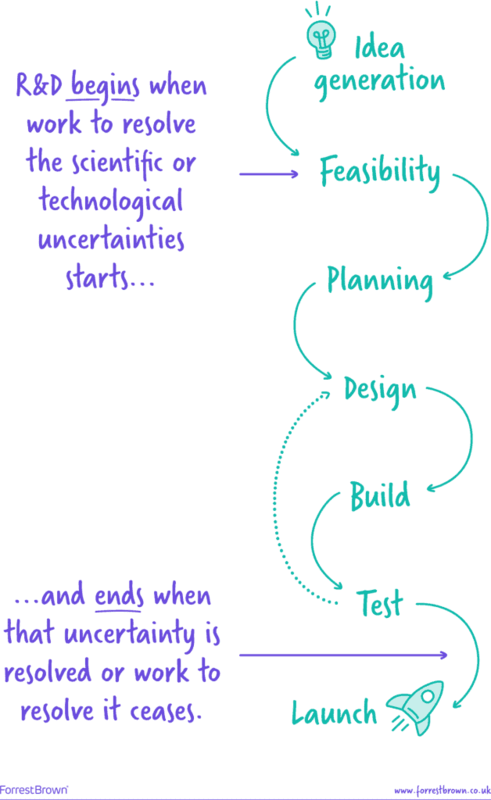 R&D work begins when a project seeks an advance in science or technology, and ends when the project’s uncertain elements have been overcome. Any user-testing or commercial marketing work beyond overcoming the project’s uncertainties will not be R&D. How do I know if my projects qualify? For a project to qualify as R&D, you should have set out to achieve an advance. That advance must be in the field of science or technology, not just in your company’s own knowledge. Your project can still be R&D if the advance has already been achieved but the details are not readily available because, for example, they’re a trade secret. It’s important to remember that R&D is inevitably not always successful. If your project is ultimately unsuccessful but sought a solution which was not evident at the outset, it could still be R&D. What kind of projects do not qualify for R&D tax credits? Generally, routine copying of existing products, processes, materials, devices or services, will not usually qualify as R&D. Work to improve the cosmetic or aesthetic qualities of a process, material, device, product or service will not itself be R&D. However, work to create certain cosmetic or aesthetic effects through the application of technology can still qualify. At ForrestBrown, our team includes not just tax specialists, but technology specialists, former HMRC inspectors, and even a rocket scientist! We work with you and use our expertise to ensure all your R&D work is captured in a comprehensive claim which optimizes the value of your R&D tax credit. Can I get R&D tax credits for a product which is a copy of an existing product? How do you identify how much R&D each staff member does? When are R&D tax credits not the right answer? This article was last updated on 9 November 2018.